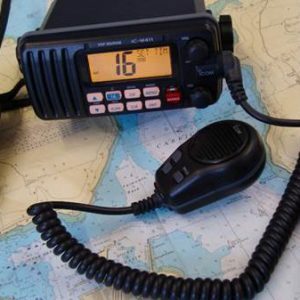 RYA Marine Radio Short Range Certificate (SRC) is the minimum qualification required by law to control the operation of VHF and VHF Digital Selective Calling (DSC) equipment on any British flagged vessel voluntarily fitted with a radio. This includes both fixed and hand held equipment using International channels. A radio is an important piece of safety equipment on board and it is vital to understand the correct procedures. Unnecessary transmissions could block out a Mayday distress call. The course will be taught and examined using radio simulators. The exam will also include a short written test. The SRC course can be taken in the classroom or online with an RYA recognised training centre. All new VHF sets are either fitted, or can be interfaced, with DSC allowing calls to specific vessels. If you hold the ‘old’ VHF licence (pre-1999) you need to upgrade your qualification if you purchase new equipment. To upgrade a Restricted VHF licence to a GMDSS Short Range Certificate you should contact your local RYA Recognised Training centre to discuss the update training required and to organise a SRC examination. As the first point of contact for students taking your online courses, you will need to outline to every new student the requirement for you to pass some of their personal data to us via www.ryainteractive.org in order for us to provide and manage their course. The required wording is shown below. Please ensure that you include it in your booking procedure for all future students to see. As the data we are collecting is required for the fulfilment of their course you do not need to obtain their consent, you just need to inform them. Please note that you will need to add the length of time for which you will provide instructional support to the statement below, which may be a year to match the length of access to the site or it may be shorter depending on your own terms and conditions. Instructional support will be provided by this training centre for a period of 1 year from the date of your course booking. On completion of your course, your name, email, date of birth and address will be transferred to the RYA’s central database for the purpose of recording details of the course and any certification you gain as a result of it. This information allows the RYA to record your certification, to update any records they may already hold about you or your qualifications and to verify your certificate if required. After one year from the date of your enrolment on the course, your user account will be removed from www.ryainteractive.org.